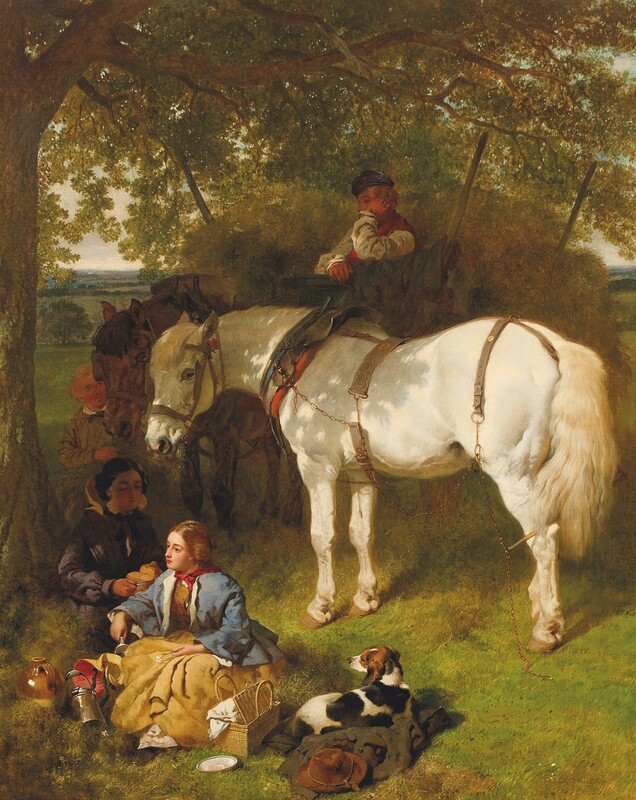 This fine painting depicts a tranquil picnic in the Kent countryside. In 1853 Herring abandoned London in favour of a Georgian house in Meopham Park near Tonbridge. Meopham came with thirty acres of land, walled gardens, an orchard, a farm yard, cow houses and a 'very pretty saddle-room'. This change in lifestyle was the result of Herring's increasing frustrations with city life, and there was a corresponding change of direction in the subject matter of his paintings. Gone were the racehorses in favour of farmyard scenes, domestic animals and depictions of a rural idyll. The present painting is a perfect example of Herring's mature style. The dappled light on the coat of the grey horse perfectly captures the warmth of a summer's day. It is noticeable that neither the animals, nor the figures, meet the viewer's gaze, an artistic device which adds to the sense of reflection and peaceful repose. The girl seated in the foreground resembles Herring's daughter, Jennie, and certainly he frequently used his family as models. Anonymous sale, Christie's London, 26th April 1974, lot 133. O. Beckett, J.F.Herring & Sons, 1981, no.272, illustrated in colour plate 34.